Well it’s coming up to that time of year for swooning, sending flowers to that special someone and even preparing a special meal or dessert. 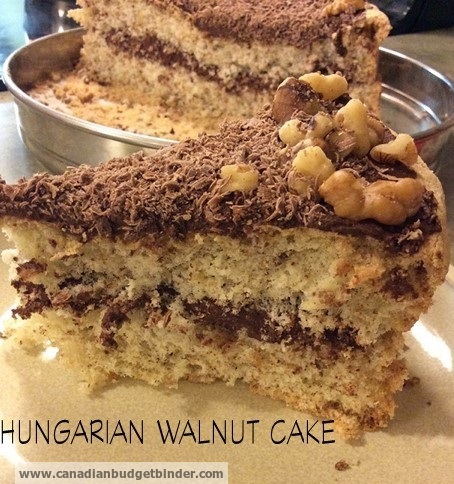 That’s right Valentine’s Day is coming up and this Hungarian Walnut Cake is the perfect treat, especially if you are a walnut lover. My husband and I really don’t go overboard buying each other gifts for Valentine’s Day as we tend to leave the excitement to the kids. I do however enjoying making a romantic meal with a delicious dessert and Hungarian Walnut Cake is what we are having this February 14, 2015. Don’t get me wrong in our younger days we went all out buying gorgeous roses, Valentine’s cards, Valentine’s chocolates even sometimes a romantic meal out on the town. If we were to do all that today we’d have to budget this night on the town as a projected expense because Valentine’s Day is costly from the flowers right down to the reservations. These days I leave a sweet note in his lunch bag and make a special Valentine’s Day cookie for him. He loves it. I also make either a delicious cake or a special meal that he enjoys that is not out of our budget limit. 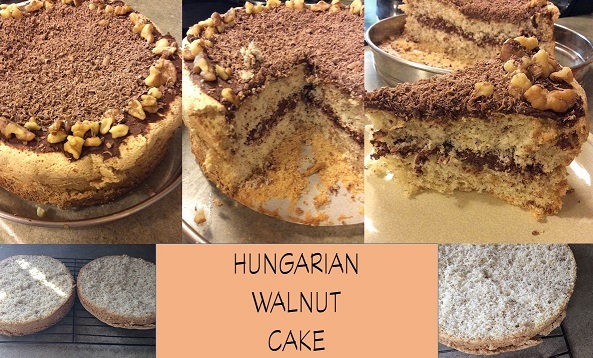 I like to create easy cake recipes from scratch so today I am going to show you how to make this Hungarian Walnut cake. The cake is so light and airy that after one slice your special someone will be asking for “more please”. Tempting? Wait until you see what the cake ingredients are because only then will see how I get the cake to become moist and airy. The filling for this cake is filled with a creamy Nutella centre that has a bit of rum in it. If you don’t prefer the rum you can add milk to make it an even creamier filling. When baking the cake be mindful of the times and your oven as every oven is different. I like to test my cakes the old-school way by inserting a tooth-pick in the middle of the cake to see if it comes out clean. That is how I know for sure the cake is done. You don’t want to over-bake it which makes is dry. The two most common major species of walnuts are grown for their seeds – the Persian or English Walnut and the Black Walnut. Walnuts are rounded, single-seeded stone fruits of the walnut tree commonly used for the meat after fully ripening. The shell encloses the kernel or meat, which is usually made up of two halves separated by a partition. Walnut meats are available in two forms; in their shells or shelled. Walnuts can be toasted, candied or even turned into walnut butter which is delicious. You may even find a luscious walnut oil that is great for salads and other recipes. How should you store walnuts? The ideal temperature for longest possible storage of walnuts is in the -3 to 0 oC and low humidity — for industrial and home storage. Walnuts, like other tree nuts, must be processed and stored properly. Poor storage makes walnuts susceptible to insect and fungal mold infestations. If you find that your walnuts are moldy don’t try and think you can save them. Just toss them in the garbage and find a better way to store and use your walnuts before they go off. Walnuts are a nutrient-dense food: 100 grams of walnuts contain 15.2 grams of protein, 65.2 grams of fat, and 6.7 grams of dietary fiber. The protein in walnuts provides many essential amino acids. Wow, I learned lots about walnuts and that’s why I enjoy doing research about different products that I use. When you about the food you eat it makes it easier to create new recipes. This Hungarian cake is not only easy to make it's very moist and full of chocolate flavour with a splash or rum in the cream filling. ¼ cup Rum or milk (If you aren't a fan of rum use the milk) The rum will give the filling a distinct rum flavour where the milk will make the filling creamier. Brush cake tin with either butter or oil then line base with parchment paper. Add egg yolks and beat for 20 secs. Transfer to a large bowl and using a large metal spoon fold in the sifted cornstarch and baking powder alternating with the walnuts folding quickly and lightly as so not deflate the air in the egg whites too much. Empty mixture into tin and bake for 20-25 mins or until the cake is lightly golden and comes away from the side of the tin. Wait 5 mins before taking cake out of tin and cool on rack before slicing it in half. For the filling place all ingredients into a bowl and mix until fully combined. Spread half of the filling on one half and then top with the other half. Now spread remaining filling on top. You can decorate with either more walnuts and shaved chocolate or with a dusting on icing sugar. There you have it a gorgeous Hungarian Walnut cake that’s easy to make with everyday pantry ingredients. Happy Valentine’s Day! Please Subscribe to the blog so you get my daily email and follow me on social media. Get every recipe from Canadian Budget Binder> Check out my new Free Recipe Index. If you like FREE then click this link for my FREE Excel Budget Spreadsheet and lists. Check out my new Ultimate Grocery Shopping Guide. Nicola, I am very impressed with Hungarian Walnut Cake. This one looks so delicious! It’s like I can’t help it but I really want to have this like NOW. I am gonna share this recipe with my wife. I hope it’s easy-to-do so that she can bake it herself. Five star. This does look interesting!! The younger boy and I have already been thinking how we can fudge it as he is the only be in the house that cares for nuttella and his brother is the one to like PB!!! One thought we had was ground almonds and maybe raspberry jam……. That was just off the top of our heads on a first look at the recipe. Oh yes, must tease the kids bringing home the valentines!!! Lol!! I still remember the year their school had a fund raiser, the kids could buy a carnation for a friend with the funds going someplace. My daughter brought home a couple of them…. From boys no less!!!! One boy had quite the crush on her back then…… I got a couple of them too….from my kids! Christine a butter cream filling would be good too. The cake is better spread when completely cooled. A trick I learned is to heat up the spatula before spreading then it’s a lot easier. You could use a coffee cream with instant coffee and some chocolate that would be a lovely filling.